(Bloomberg) -- President Donald Trump warned Turkey not to attack Kurdish forces in Syria after a planned U.S. pullout, saying the NATO ally would be economically devastated if it did so. 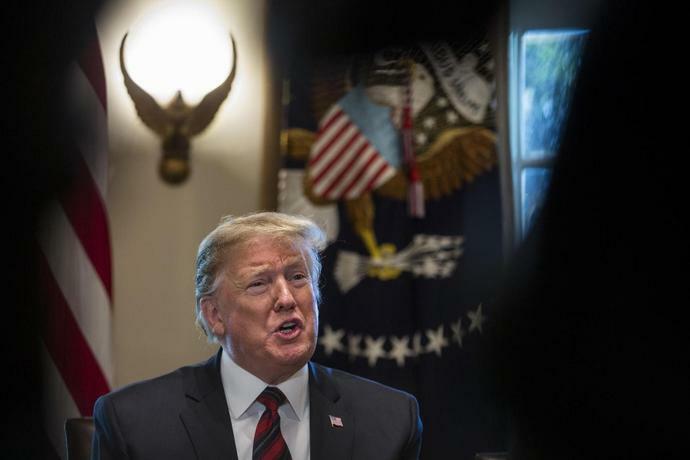 In a Sunday night tweet, Trump said his government was starting the "long overdue pullout" from Syria while hitting the "little remaining" Islamic State "territorial caliphate" and would attack again from a nearby existing base if the jihadist group regroups. "The U.S. is withdrawing from northeast Syria in a strong, deliberate and coordinated manner, and seeks to ensure that the forces that have fought alongside coalition partners in the campaign against ISIS are not mistreated," an administration official said following the president's tweet. The Turkish lira sank. Trump's hasty announcement in December of a U.S. exit from the war-torn country has caused confusion among allies and adversaries alike, and it also led to the resignation of Defense Secretary James Mattis. Erdogan has been massing Turkish troops on the Syrian border for weeks, preparing for an operation to eradicate Kurdish forces that the U.S. has vowed to protect. The U.S. and Turkey have been allies for more than six decades, but in recent years their relationship has been repeatedly strained by disputes. U.S. support for a Syrian-led Kurdish militia known as the People's Protection Units, or the YPG, that Turkey considers a foe is the source of one rift. The Trump's latest tweets drew a quick reaction from Ankara, where the presidential spokesman Ibrahim Kalin said Turkey is fighting "against terrorists, not Kurds." "Mr. Trump, terrorists can't be your partners & allies," Kalin said on Twitter. "It is a fatal mistake to equate Syrian Kurds" with the YPG, which is the Syrian branch of a militant organization that Turkey has battled for over three decades, he said. The lira slipped again after the latest Trump tweet. The currency was trading 1 percent lower at 5.5183 per dollar at 11:21 a.m. in Istanbul, leading declines across emerging market peers. America's continued support for the YPG in the wake of the decision to pull U.S. troops from Syria prompted Turkish President Recep Tayyip Erdogan to snub Trump's national security adviser last week, after John Bolton had received a warm welcome by Israeli officials days before. "Although we made a clear agreement with U.S. President Trump, different voices are emerging from different parts of the administration," Erdogan said as Bolton prepared to leave town after meeting other Turkish officials. "Trump's remarks continue to be the main point of reference for us." The delay has restricted Turkey's ability to launch an offensive against the YPG, a group of Kurdish fighters it considers terrorists, but who served as allies to the U.S. coalition to defeat Islamic State.